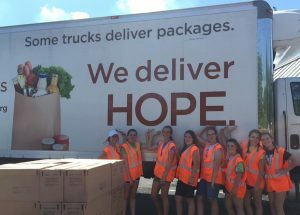 Article submitted by Katrina Royster, Challenge Volunteer in Indiana. 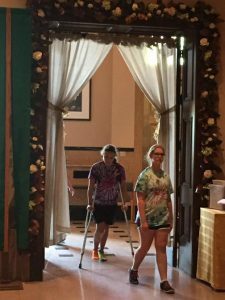 St. Michael Challenge’s group held their annual Girls Getaway from July 11-14, 2016 at Our Lady of the Apostles Family Center in Greenfield, Indiana. The theme was Live It: Let Your Light Shine. What started out as a couple acts of mercy in the planning process of the St. Michael’s Challenge Girls Getaway Camp quickly morphed into an entire camp filled with all of the corporal acts of mercy; a talk and a walk through the Saints Peter and Paul Cathedral’s Holy Door of Mercy fittingly reminded the 21 campers, 10 team leaders, and multiple adults that mercy was something for them, as well. Monday afternoon on July 11, 10 team leaders set out to welcome 21 campers with the ceremonial tie-dying of their camp shirts, the service uniform for the girls while at camp. This helped break the ice before the girls broke into their teams to start their week of mercy: 5/6 graders shopping for items for birthday bags for the food pantry, 7 graders learning the art of crocheting plastic bags into sleeping mats for the homeless, and 8 graders journeying outside their community to a Gleaner CARE mobile food pantry. Each group returned with stories and laughter to share, as well as reminders of God’s provision. The club’s service continued with rotating stations and the making of military cool ties, denim shoes for impoverished children oversees, and rosaries for the prison ministry. The room bustled with chatter as these girls busily crafted. 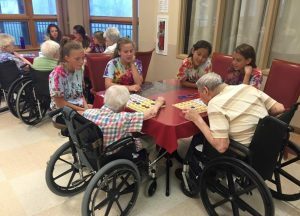 Highlights for the girls included a trip to St. Paul Hermitage to sing and play bingo with the elderly residents. Emily Royster, a team leader, lovingly told the story of meeting a resident that was a nun. Her name happened to be Emily, too. On multiple occasions, Emily the nun reintroduced herself with a big smile and outstretched hand to Emily, saying, “My name is Emily, too. Put ‘er there.” The visit made such an impact on the girls that plans are already in the works to return. 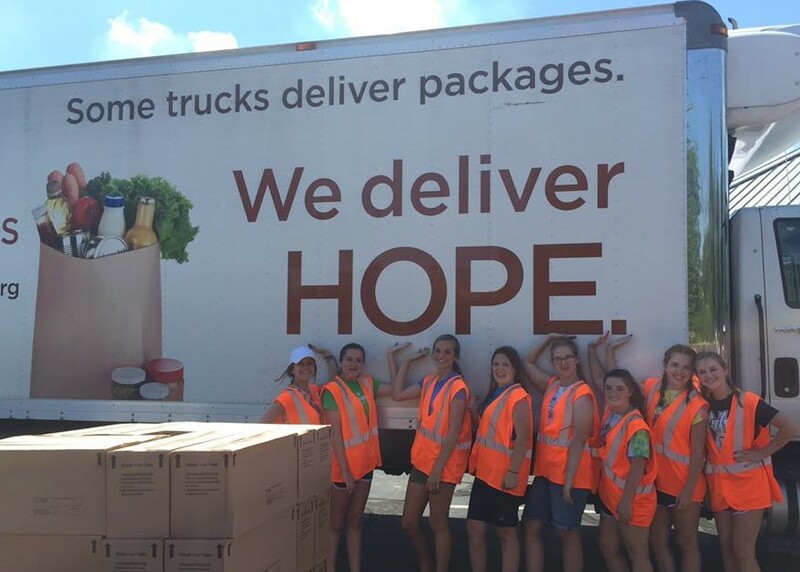 Another popular service project was the day spent at Gleaners Food Bank. 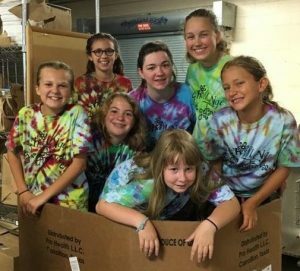 In the midst of exploding soda, boxes big enough to hold many Challenge girls, and food worthy of a science project, the girls worked tirelessly to sort, count, and deliver food to its appropriate destination, as well as do whatever other task that was asked of them. A spiritual highlight, as well as a rare opportunity, was the Holy Door experience. On the fourth day of their camp, the girls shared a talk about the Jubilee Year of Mercy and indulgences, prayer, and confession with Rev. Msgr. William Stump, vicar general and moderator of the curia, as well as former priest of St. Michael Church. 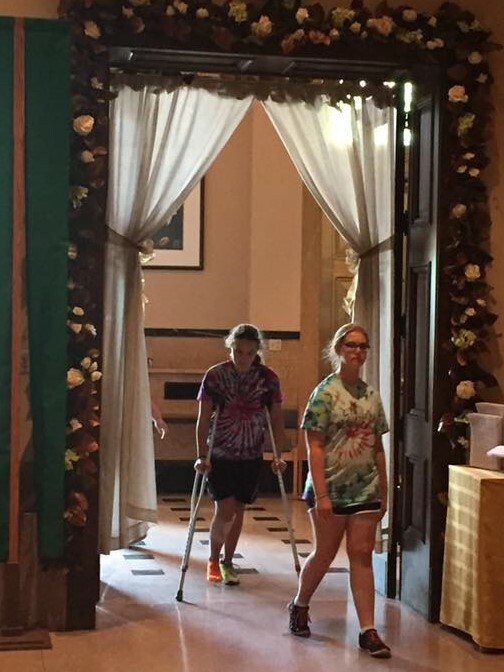 The girls also walked through the Door of Mercy. The girls particularly enjoyed the service projects where they were able to directly interact with the people that they were trying to serve, whether it be singing to and playing games with elderly residents, pushing shopping carts to people’s cars, or learning a craft from a lady who had personally visited and fed the homeless. These experiences brought the community closer and allowed ministries to work together as pieces of a puzzle. Talks led by the Consecrated, singing, adoration, Mass, prayer time, and the Holy Door indulgence experience reminded the girls that service is more than just doing some nice things for others less fortunate because it “makes you feel good.” These girls are being the hands and feet of Jesus on earth because that is what Jesus asks us to do. In doing this, the goal is to give glory to God so that as much as being thanked for these nice things the girls are doing, they are reminders to others to give glory to God, because God is indeed providing through service of others. The Challenge girls have opportunities to be answers to others’ prayers. The attraction and the curiosity from others of the service that Challenge does is evident. One younger brother asked what Challenge was. After the explanation, he commented, “They need something like that for boys! Subscribe to receive the latest information and news about Conquest and Challenge.